AgriSeq targeted genotyping by sequencing (“GBS“) solutions include a Bovine ISAG 200 Parentage Panel that delivers more lineage information and flexibility to cattle breeders. Thermo Fisher Scientific announced the launch of the new Applied Biosystems AgriSeq targeted Genotyping by Sequencing (GBS) solutions, including the Bovine ISAG 200 Parentage Panel, at the International Society for Animal Genetics (ISAG) conference in Dublin, Ireland. These innovative solutions provide more actionable lineage data than previous panels, enabling breeders and producers to make more informed herd management decisions. Evaluation of 96 diverse bovine gDNA samples from the United States Department of Agriculture (USDA), representing 19 different breeds with the Bovine ISAG 200 Parentage Panel (2013), n = 4. 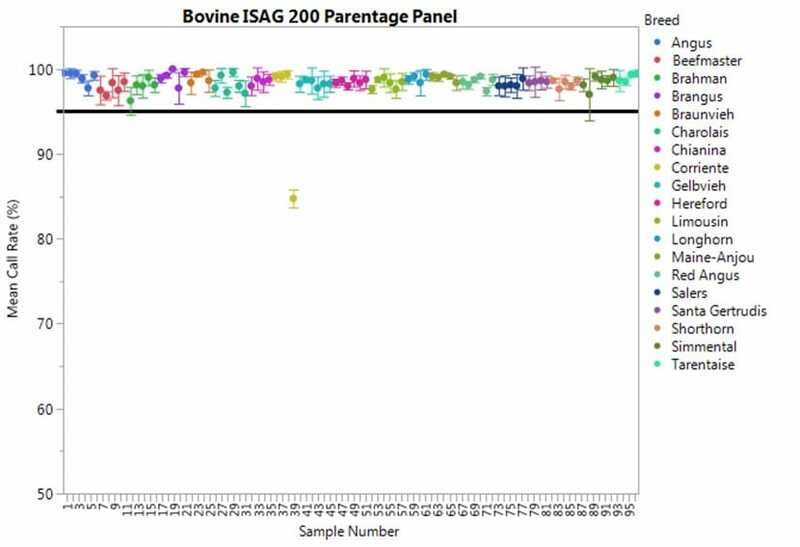 Thermo Fisher’s Bovine ISAG 200 Parentage Panel is based on 200 bovine single nucleotide polymorphisms (SNP) markers selected by the ISAG for the purpose of verifying bovine parentage. This panel has been successfully validated across 19 common breeds and qualified using the 2015 ISAG/ICAR SNP typing comparison samples, all of which help confirm the panel’s ability to support routine bovine parentage analysis. The panel complements the newly launched Applied Biosystems Axiom Bovine Genotyping Array with 51,000 markers and includes markers associated with important traits. Targeted GBS is the latest innovation in genomics-assisted breeding programs. The AgriSeq GBS technology is flexible to combine parentage and genetic fitness markers into a single, efficient, low-cost test, with capability of simultaneous detection of up to 5,000 markers. Combined with the capability to batch up to 1,536 samples in one next-generation sequencing run, AgriSeq targeted GBS offers enhanced throughput and flexibility to streamline lab operations that involve demanding sample workload and test menus. 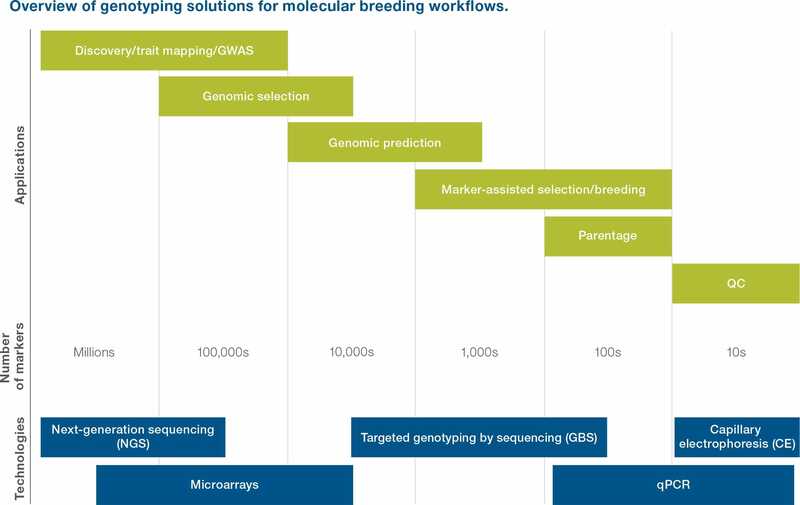 “Recent advances in targeted next-generation sequencing technologies are creating new opportunities for service labs to expand the breadth of variants evaluated in a single, low cost test,” said Maarten de Groot, Chief Financial Officer VHL Genetics and current AgriSeq user. AgriSeq targeted GBS is one platform in Thermo Fisher’s wide range offering of technologies to facilitate molecular breeding and functional genomic efforts. The broader portfolio includes the Axiom genotyping microarrays, TaqMan genotyping assays and STR-based animal genotyping kits, which together offer a wide range of solutions from high density discovery tools through low density quality assays. Each technology has been designed for optimal accuracy, robustness and compatibility across agricultural applications. From discovering new genetic variants through de novo genomic sequencing to confirming the identity of a few markers across a large number of samples, our extensive portfolio of instruments and consumables can help provide customers with answers quickly and efficiently. Thermo Fisher hosts an AgriSeq workshop during ISAG, where de Groot from VHL Genetics discusses implementation of the AgriSeq targeted GBS in VHL Genetics’ genetic evaluation programs to improve lab efficiency, throughput and cost per genotype for production and companion animals. In addition, two oral presentations on the AgriSeq technology development and application to bovine and canine genetics have been selected for conference participation within the ISAG conference program.